I want to commend and congratulate President Obama today for launching the Better Buildings Challenge, a White House driven program that will ramp up significant commitments to green building. Once again, the President is taking action and inspiring action in the building industry so we can seize the tremendous opportunity in green buildings. We know we could be saving $130 billion a year if we had greener, more efficient buildings and create nearly 1 million jobs in the process. Through this dynamic new program announced at President Clinton’s CGI American event, we can begin to scale and accelerate the green retrofit industry, and ultimately stimulate our economy by saving energy, saving people money, and putting America back to work. And we are absolutely committed to engaging our 16,000 members, our more than 170, 000 LEED Professional Credential holders and our 79 chapters across the country to advance the Challenge and encourage the use of our LEED Green Building Rating System as a pathway to ensuring the immediate, measureable and proven results this Challenge is meant to create. Read more on the Better Buildings Challenge. Read more on the Better Buildings Initiative Jobs Report. The opportunity available in green building is like its own annual stimulus package. But instead of seizing the opportunity, we’re losing $130 billion a year from inefficient buildings, according to McKinsey & Co. The culprit, also according to McKinsey in their influential study, was sundry barriers – micro and macro and in broad categories like finance and behavior – that were often grimly described as intractable and pervasive. But what a difference a president can make. In 2007, President Clinton launched – what we can now say as we look back – one of the industry’s most prescient and effective programs: the Energy Efficiency Building Retrofit Program. The program, helped launched in partnership with USGBC and several other key stakeholders including cities, energy service companies and key players from the financial sector, took a creative and market-based approach designed to leverage collaboration (btw, does anyone do that better than President Clinton?) to tear down the stubborn barriers to retrofitting our existing building stock. The program has spurred thousands of retrofit projects around the world and worked effectively to institutionalize and multiply its impact by creating the standardization models – for things like procurement, contracting and financing – that make the process easier for each subsequent retrofit project. Most importantly, President Clinton showed the power of leadership. He used his unparalleled post-presidency bully pulpit and his organizational capacity at the Clinton Foundation to shine a light on the tremendous opportunity in energy efficient buildings. (For example, in addition to the opportunity to save $130 billion a year, we could also create nearly a million jobs from a robust retrofit industry). For us, it’s no coincidence that since President Clinton and our President and CEO and President Rick Fedrizzi began working together five years ago, USGBC is now certifying more LEED existing building space than new construction, and, more importantly, that the total square footage of LEED-certified existing buildings exceeds the total certified space of new construction projects. Their leadership significantly contributed to a more universal focus on unlocking the efficiency potential in our existing buildings. This heightened focus yielded the certification of more LEED for Existing Buildings projects in 2010 than in the six previous years combined. Even more convincingly, existing buildings now account for nearly half of the more than 1.5 million square feet of LEED projects that are certified every day. To put a finer lens on the work the President is doing in this area, note his recent Time Magazine article where he summarizes 14 of his job creation ideas. Four of them are green building related. One is simply titled, “Copy the Empire State Building.” Not a bad example. The signature project, a partnership of the Clinton Climate Initiative, Jones Lang LaSalle, Johnson Controls, Rocky Mountain Institute and Nyserda, cost about $20 million, has a just a 3-year payback, reduces energy by 38 percent, saves $4.4 million annually, and created more than 250 jobs. Further, President Clinton’s work and message have helped seed the substantive and significant policy and program ideas for President Obama’s Better Buildings Initiative (BBI), which was launched this past February. In fact, President Clinton was asked by President Obama to lead the efforts on energy innovation in the important work the President’s Council on Jobs and Competitiveness is doing to stimulate job creation. And today during the Clinton Global Initiative America (CGIA) conference, President Clinton is doing it again. To spark jobs in the US, the President is convening leaders from across the country to explore solutions and make commitments that will create jobs and get America working again. Because the President sees such opportunity in green building, it will be one of ten major working areas. As a topic facilitator for the Green Building working group at CGIA, I’m helping organize the session and I’ll also be reporting on both the discussions and the exciting green building related commitments. Again, at this next inflection moment for green building, President Clinton is showing the way and fostering the type of partnerships that will inspire new thinking and spur new investment, innovation and action - ultimately accelerating the movement and our transition to sustainable built environment. Now that summer is in full swing, we are all hoping for a bit of calm and relaxation. But kicking off your shoes now may put you behind in the fast-paced green building policy race that has – month after month – continued to increase in speed and momentum since last year’s exciting launch of a new set of regulatory tools. The International Green Construction Code (IGCC) – which includes similarly intended Standard 189.1 – establishes a previously unimaginable framework for a code and regulatory approach to better building design, construction and renovation. The set of codes and standards address energy, water and resource efficiency; materials use and indoor air quality; and also provides code-intended language to address issues at the nexus of a building and its built and natural contexts. Importantly, this first-of-its-kind set of tools leverages the previously untapped code enforcement infrastructure to achieve greener building outcomes. In truth, the shift is actually quite powerful. When multiplied over and over in nearly every building across the land, the seemingly minute human and environmental health risks that green building rating systems – and now green building codes – intend to address are staggering: pollution of all types, escalating emissions from greenhouse gases, depletion of scarce resources, destruction of habitat, human health risks of inactive or at least indoor lifestyles—and the list goes on. These risks are large not only because they spawn from between the cracks of the very fabric of our built world, but also because they are cumulative and aggregate over time. This natural next step for codes and regulations is modern-day recognition of the code official – alongside licensed professionals – as a line of defense against some of the world’s greatest emerging threats to public health and safety. But as game-changing as that sounds (and it is), we need all the right levers working simultaneously to enable truly sustainable buildings and communities. The LEED Volume Program allows large users of LEED to certify buildings across their portfolio in a streamlined fashion, bringing a new level of speed and efficiency to our mission of greening the built environment. LEED Volume unites the large-scale building and management efforts of organizations with the rigor of LEED. With this morning’s launch of the LEED Volume Program for Operations & Maintenance at the annual BOMA conference in Washington, D.C., we’ve hit two key milestones. The first: Opening up the landmark LEED Volume Program to existing buildings, the industry’s most promising sector with the most ubiquitous presence. To date, an impressive 625 LEED projects have been certified through the LEED Volume Program, including the Design & Construction track, launched last year at Greenbuild. Now, after being successfully shaped and applied by 11 pilot participants*, from large retailers such as Kohl’s Department Stores to commercial real estate service providers like Cushman & Wakefield, the launch will enable organizations of all types to access the benefits of the LEED Volume Program for their existing building stock. And the second milestone: Contributing to the momentum and enthusiasm we are seeing for greening existing buildings. In his recent Newsweek cover piece, Bill Clinton said, “We could put a million people to work retrofitting buildings all over America.” President Obama’s Better Buildings Initiative is projected to create over 114,000 jobs - 77,000 of those resulting from a revised tax incentive to encourage building retrofits. Retrofitting commercial buildings could save up to 200 million metric tons of carbon emissions each year. Given this momentum, the BOMA conference could not have been a better venue for the launch of an expanded LEED Volume Program. The 16,500+ members of BOMA are the movers and shakers of the building industry. They’re ahead of the curve, on top of the technology, and aware of the incredible power that lies in retrofitting smart, sustainable structures. But they aren’t the only ones privy to this knowledge about existing buildings. Across the building industry, from local to federal government, and throughout the business world, the potential of retrofitting our existing building stock is being realized. Retrofits are the future, and the LEED Volume Program for Operations & Maintenance presents organizations, companies, governments and campuses a way to revamp their existing buildings – in a streamlined, cost-effective, and business-savvy manner. *Pilot participants also include: American University, Bank of America, Bentall Kennedy, City of San Jose, InterContinental Hotels Group, Stop & Shop, University of California Santa Barbara, University of Florida, and Wells Fargo. Before the green building movement that USGBC helped launch roughly 20 years ago, the seeds of another profound international green movement had been planted to fundamentally transform our ability to feed the world. The Green Revolution, a term coined by former USAID Director William Gaud in 1968, has been in full force for the past seven decades, doing what the name implies – revolutionizing how we increase our global food production and therefore fighting world hunger and dramatically increasing global food security. Yesterday in the Ben Franklin room of the State Department in Washington, DC, I attended the announcement of the winners of 2011 World Food Prize, the foremost international award recognizing the achievements of individuals who have led in improving the quality, quantity or availability of food in the world. Twenty-five years ago, the prize was inspired and created by Nobel Laureate Dr. Norman Borloug, a visionary agronomist who, through the development of more resilient varieties of wheat and other major advancements in agriculture that he promulgated to the rest of the world, is credited with saving over a billion people worldwide from starvation. Today, the Prize – considered the Nobel for agriculture – recognizes contributions in any field involved in the world food supply and security -- food and agriculture science and technology, manufacturing, marketing, nutrition, economics, poverty alleviation, political leadership and the social sciences. This year’s award winners were former presidents John Agyekum Kufuor (Ghana) and Luiz Inacio Lula da Silva (Brazil), who created and implemented government policies to alleviate hunger and poverty in their countries. 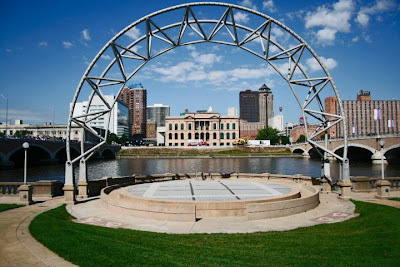 Interestingly, later this year, the work of the World Food Prize Foundation and the green building movement intersect at the coordinates of a 108-year-old building in Des Moines, Iowa – what will soon be called the Dr. Norman E. Borlaug Hall of Laureates, headquarters to the Foundation. The building, originally the Beaux Arts city public library first built in 1903 in the historic downtown, is undergoing a major restoration led by the World Food Prize Foundation’s President, Ambassador Kenneth Quinn, who has his sights set on achieving LEED Platinum. The $29.8 million capital project is also an example of an inspirational civic collaboration that garnered significant support from the city, the county, the state and sponsors – all dedicated to restoring this indelible city landmark, which will now serve as a museum to recognize great achievements in agriculture as well as a convocation and conference center. “Not only will this building showcase artwork and exhibits, but the restoration of this marvelous architectural gem will also show how a building designed in the 19th century can become a terrific example of energy savings and green technology in the 21st century and beyond,” said Quinn. While maintaining its historic awe and grace, the design for the building also includes some of the latest green features, including 100 geothermal wells, discreet solar panels on the roof, an 8,000 gallon rainwater cistern, and local and recycled materials. The result is the paragon of integrated design that achieves the essence of green building – a unique and market-leading incorporation of energy efficiency, water conservation, sustainable siting, environmentally friendly materials and resources, improved indoor air quality, and innovation. “The World Food Prize emphasizes the importance of a nutritious and sustainable food supply. It only makes sense our future home should be environmentally responsible,” said John Ruan III, World Food Prize Chairman. Indeed, this restored historic building and headquarters for the World Food Prize Foundation will be a shining example of green building excellence and worthy of the work the Foundation is doing to address the global challenges of food production and security. Dr. Borlaug, often called the father of the Green Revolution, would be proud. As Green Building Codes and Standards Emerge – Where Do We Go from Here? The success of the LEED green building rating systems in driving amazing amounts of green building activity, driving focus on a broader spectrum of human and environmental health issues and driving leadership in achieving a more sustainable future has created space for many other conversations to take place – from the bleeding edge to the minimum code level. A year after the launch of a previously unimaginable code framework to advance regulatory change towards better, greener building practice, where are we? And where do we go from here? The industry is abuzz with questions about how a green building code may change their business outlook, change the laws or even change the world. There’s no doubt that broadly-applied minimum regulations for better, healthier, more efficient and environmentally sensitive building practices necessarily push a lot of buildings, professions and professionals forward. For jurisdictions that are interested in upping their minimum requirements, USGBC is encouraged that there are now tools available to facilitate that critical piece of the green building policy puzzle. But there is nothing gained by added confusion, or by a diminished understanding of what a green building is or aspires to be. Codes can do an effective job of delivering minimum performance – and that’s important. But if you’re looking for a non-mandatory approach to build greener buildings, a green building code is not designed for you. As we draft the updates to LEED, there is so much progress that we can point to as reasons to keep driving onward toward restorative and regenerative buildings and communities. We invite you to participate in that development (LEED is re-opening for second public comment on July 1, 2011) and also in the final rounds of development of these green building codes and standards. The balance is nuanced but codes and rating systems fundamentally serve different functions, and we need to focus on improving all of them so that they each may fulfill their maximum potential. Neither one nor the other alone is as strong as both push and pull forces working collaboratively. It’s not a choice between codes or rating systems – one is a decidedly rigid mandatory minimum (with a handful of jurisdictional and performance pathways built in) and the other a leadership engagement tool that intentionally (and in its next version, increasingly) steps out of the way of design professionals to innovate and improve green building outcomes. We need both improved minimum codes and voluntary beyond-code rating systems to get the job done (see related policy brief). Clearly the only way to go from here is onward, which is what USGBC intends to do. We hope you’ll work with us to achieve truly sustainable buildings and communities using all the best tools for the job. For more information, review USGBC’s white paper: Greening the Codes. The Institute of Medicine’s recently released report highlights the critical interrelationships that exist as our society struggles with the global and local impacts of climate change. While the report focuses specifically on the potentially negative human health impacts associated with efforts to lower carbon emissions from the built environment, we are confident that the report authors understand that interconnected problems cannot be solved in isolation of one and other. This report calls for increased focus on direct human health impacts of new technologies and strategies being employed in response to the climate change crisis our world faces. It is not acceptable to solve one set of problems by creating another. Rather, an integrated approach to these (and other) interconnected challenges needs to be employed to achieve solutions that solve problems in a systematic way. The LEED green building rating system does this by prioritizing strategies and solutions that help to mitigate climate change while heightening human health: By promoting a whole-building approach to sustainability that takes into account all areas of human and environmental health: sustainable site development, water savings, energy efficiency, materials selection and indoor environmental quality. Through its uptake, LEED has started a global conversation focused on the cumulative impact of buildings on environmental and human health. High-performing, LEED-certified green buildings are not only helping to solve the critical challenges posed by climate change, they’re leading to a new generation of contaminant-free buildings that protect the indoor air we breathe and minimize the risk of building-related health problems. USGBC applauds the study for continuing the dialogue on building impacts and for shedding light on the profound gaps in substantive building-related research. Today USGBC, with our partners at the Real Estate Roundtable and the Natural Resources Defense Council, released an analysis conducted by the Political Economy Research Institute that concludes that President Obama’s Better Buildings Initiative (BBI) will create over 114,000 jobs. As background, the Better Buildings Initiative is a collection of legislative proposals and federal agency actions designed to encourage the efficiency improvement of commercial buildings. The President has recommended tax incentives, grant and challenge programs, and increasing the availability of financing for the improvements. The analysis covers the major components of the initiative: the tax incentives, the financing programs, and the grant programs. The Better Buildings Initiative would create more than 114,000 jobs. The greatest jobs-creating impact – over 77,000 new jobs – would derive from a revised tax incentive to encourage building retrofits. New job creation would ripple throughout the economy. New jobs would be created directly at construction sites, which in turn would spur more jobs in the manufacturing and service sectors. The Better Buildings Initiative’s federal incentives are an investment to trigger private sector spending, which in turn produces widespread benefits. For example, tax incentives would encourage at least three times as much private investment to make buildings more efficient. Businesses would save over $1.4 billion in energy bills as a result of retrofit projects spurred by the tax incentive, which would in turn be re-injected into the economy. The most significant job creator considered is the revision of the existing tax deduction for energy efficient commercial buildings, section 179D. These are the same revisions supported by 86 diverse organizations and the subject of the recent letter to the Senate written about last week. The proposal with its unique structure would create 77,000 jobs while achieving real quantifiable energy efficiency improvements. Actual measured performance is required to take full advantage of the redesigned incentive. The report also outlines how these jobs would be created in engineering and in performing the retrofits, manufacturing the new efficient equipment and materials, operating, commissioning, and servicing the buildings, and finally in the re-spending of the significant energy savings. The conclusion that commercial building energy efficiency creates jobs, and a staggering number of new jobs is not new. This report joins and supports the conclusion of a host of others on the topic. McKinsey found 600,000 to 900,000 new jobs in energy efficiency over all sectors. ACEEE found 333,000 new jobs in proposed energy efficiency legislation last year. Over 150,000 of these jobs were from the bi-partisan yet now politically infeasible HomeStar program for home retrofits. UC Berkeley found that California’s energy efficiency policies on the books will create 200,000 jobs by 2020, with more jobs of higher quality possible with some additional measures. With this new analysis we now know how much of the huge opportunity for job creation through energy efficiency may be achieved through implementation of the Better Buildings Initiative. USGBC and its member companies will continue to support the agencies moving forward with the administrative components of the BBI while working with our many allies to convince Congress to move forward with the changes to the tax code that could potentially unlock a huge number of jobs in commercial energy efficiency. Stay tuned to this blog for opportunities to get involved. Today the Senate Energy and Natural Resources Committee continued its efforts to craft energy legislation that can gain bipartisan support in the Senate by hearing testimony on key green building and efficiency legislation. The panel heard from leading private sector and government witnesses regarding S. 963, the “Reducing Federal Energy Dollars (RFED) Act of 2011,” which Sen. Tom Carper (D-Del.) announced at USGBC’s annual Government Summit. RFED, which is supported by USGBC and many others in the building community, ensures that federal buildings and future federal leases go through commissioning, or “tune-ups,” on essential building systems to maximize performance. In testimony before the Senate Environment and Public Works Committee earlier this year, USGBC highlighted commissioning as one of the most cost-effective strategies for reducing utility costs in buildings and encouraged its use toward greening the federal buildings stock. The bill also makes it easier for federal agencies to use private financing tools to pay for energy-efficient building upgrades, increases clarity of agency energy use, and allows for building design updates. The committee also heard from the witnesses on S. 1000, the “Energy Savings and Industrial Competitiveness Act.” The measure from Senator Jeanne Shaheen (D-NH) and Senator Rob Portman (R-Ohio) includes many similar proposals advanced in the “American Clean Energy and Leadership Act of 2009” or (ACELA). The broad-based bill increases efficiency standards for appliances and building energy codes. It creates new loan programs and expands existing ones to encourage efficiency upgrades, as well as boosts energy conservation within the federal government. At the hearing, Senate Energy Chairman Jeff Bingaman (D-NM) and Ranking Member Lisa Murkowski (R-Alaska) did not indicate when the committee might begin the process of considering these bills to move them along to the Senate floor for full consideration. However, as energy prices continue to rise there will be continued pressure to address both the demand side of energy use as well as production. In my last post I gave a very simple answer to the question, “How stringent should a first-ever model green construction code be?” In sum, the answer is that it should be above current code (but not too far), fully recognizing that these decisions will be the result of important community discussions (like this very in-depth and continually evolving conversation in New York City). But before you consider dropping everything to start from scratch, remember that’s where we started. Without a national model, fragmentation and regulatory dissonance will only grow. If you’re a developer or building owner who builds or manages real estate in more than one jurisdiction, you’re already familiar with how challenging it is to comply with a different set of rules nearly everywhere you go. The International Green Construction Code and the Standard 189.1 compliance option are working together to offer uniformity, consistency and a focused forum for deliberation of what to leave in, what to leave out, and… how stringent it should all be. Beyond the simple answer listed above, there are a lot of smart people working hard to figure out how to answer this question within the text of the national model codes and standards. If you map the current technical content, its trajectory and the development schedule of the base building codes (including fire, plumbing, mechanical, zoning and other codes) you’ll get a sense for where “the floor” is. The so-called “floor” is today’s minimum acceptable safety codes and standards that draw a line between legal and illegal building design and construction. You can trace all the way back to the federalism vs. anti-federalism debates of the late 1780s to explain why a simple one-size-fits-all “floor” does not exist in this country1 – neither in theory nor application – but the International Code Council’s I-Codes may provide the best-available starting point. No matter the threshold, there isn’t much about a regulatory line in the sand that galvanizes excitement about moving above and beyond, so that’s where beyond-code green building rating systems come in. If you map the current technical content, its trajectory and the development schedule of beyond-code rating systems like LEED, Energy Star and the Living Building Challenge, you’ll get a sense for where “the ceiling” is. The so-called “ceiling” is today’s upper limits of what the building community is striving to build for the reward of a beyond-code label, like a LEED plaque. Naturally a LEED Platinum label describes a more vaulted ceiling than a LEED-certified label. Even still, you get the idea that beyond the “push” of minimum regulation, rating systems are pulling building practices and technologies into a space beyond the base codes, but at a level at which most firms can participate and compete. Map all of these points and graphs against increased demand for minimum code protections as well as geographic, climate and ideological diversity and you’ve pretty much got your answer of where – on the stringency continuum – this next generation of regulatory minimums should be. But there’s more. Take a very close look at green building rating systems and credit-by-credit compliance to determine achievable thresholds, methods and technologies that have been tried-and-tested enough to be code worthy, and plot those on this same graph. If the data tells us that certain measures in rating systems are commonly avoided or that compliance has been somewhat challenging, it would be difficult to argue that these measures are “street-ready” for codes that will serve as a new mandatory minimum for all buildings. If compliance with rating systems looks good and cost-effectiveness is a no-brainer, let’s put it in code language and get it out there. But relinquishing even simple ideas and credits from rating systems to codes without an understanding of what compliance will look like through the codes may not be in anyone’s best interest. As jurisdictions begin implementing first-generation green building codes and standards we’ll have a better idea of what ideas that LEED pioneered can be left to code enforcement alone. USGBC is currently working on parts of this analysis that will help to inform these types of decisions. Through the emerging Green Building Information Gateway we expect to unlock the potential for data- and outcome-based decision making, resulting in a smarter LEED, better codes, and a better informed building industry. 1Here’s a topic better suited for another day: if a 2009 McKinsey report tells us that 23% of the potential energy efficiency savings is available through the effective application of energy codes and standards, it seems a bit ludicrous that state and local jurisdictions have almost absolute authority to effectively direct a major piece of our national energy policy – let alone the consequences to owners and tenants of inefficient buildings. Ever feel tongue tied when you are out there advocating for green buildings? How do you explain the environmental, health and financial benefits of green buildings to the media? To your mom? What about to a local union rep, or a school teacher? What kind of story do you tell? This week on June 8, Urban Green Council, the USGBC Chapter based in New York City, will host Speak Green, a conference for green building professionals on how to message the value of green buildings and communities to the general public and other critical stakeholders. Sponsored by Carrier Corporation, the conference will feature panel discussions exploring lessons learned, roadblocks to widespread adoption, and messaging strategies from a variety of perspectives. USGBC’s own Judith Webb, Senior Vice President of Marketing and Communications and 30-year media strategist, will lay the foundation for the conversation on green building messaging – and an array of expert speakers will offer expert advice from around the industry. Speakers include Duane Bray of global design firm IDEO, Pat DiFilippo of Turner Construction, John Mandyck of Carrier Corporation, Kim Slicklein of OgilvyEarth Worldwide, and many more. Curtis Ravenel, Global Head of Bloomberg’s Sustainability Group, will deliver the keynote. In our professional training efforts as green building advocates and leaders, the critical topic of messaging and persuasion is often overlooked. No matter what your role or experience in the green building movement, effective communication is something we can all practice and improve. In the end, our movement is all about people. The relationships we build and people we engage will truly help us reach our vision of green buildings and communities for all within this generation. Tickets are still available to Speak Green – significant discounts are available for LEED APs and students. 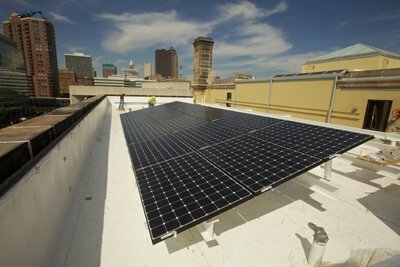 A few weeks ago USGBC, along with the Natural Resources Defense Council and the Real Estate Roundtable, spearheaded the development of a letter sent to several key Senators on proposed changes to the tax deduction for energy-efficient commercial facilities, as put forth by President Obama as a component of the Better Buildings Initiative. The letter outlines a few key principles uniting an extremely broad stakeholder community around commercial and multifamily energy efficiency, and you can take a look here. As background, the tax policy, known as Section 179D, was designed to encourage the construction of energy-efficient commercial buildings. The section allows a building owner to take a deduction of up to $1.80 per square foot of space for buildings that are constructed to be 50% better than the 2001 energy code. Enacted in 2005, back before the recession decimated new construction, the policy has been dogged by a lack of clarity on how to document compliance and take the deduction. Multiple requests have been made to DOE and IRS to fix these problems, and it appears that the agencies are finally working to provide some more usable guidance. Helpful as that will be, 179D was not designed to encourage the large-scale retrofits of existing buildings. Changing times have made encouraging retrofits not only a component of the President’s plan to “Win the Future,’ but also the focus of stakeholders in the commercial real estate industry. To illustrate, consider the internationally recognized retrofit of the Empire State Building. Owner Tony Malkin decided to not just renovate and update the iconic building, but also to make it as energy efficient as possible. He assembled a team of the Clinton Climate Initiative, Jones Lang LaSalle, Johnson Controls, and the Rocky Mountain Institute to create a showcase project for efficiency innovation. The retrofit team managed to slash energy consumption by 38%, saving more than $4 million each year. The entire process considered more than 60 different energy efficiency measures and was optimized with eight simple measures executed under a performance guarantee contract. The measures (such as renovating the windows in a pop-up factory on the fifth floor of the building) have maintained the historic character of the facility. The project has been submitted for LEED EB:O&M certification, and according to the project team, targeting the LEED-Gold level. This success story (www.esbsustainability.com) has raised awareness of what is possible in a quantitatively driven energy efficiency retrofit in even the world’s most iconic buildings, but this project would not qualify for the existing tax deduction. Why not? The issue is one of baselines, where the existing policy has a code baseline as used in new construction, where as the Empire State Building cut consumption compared to where it began. Shifting the baseline for an existing building to compare to previous performance is one of the principles that united the industry in support of this proposal. Measure energy savings compared to the existing building baseline. Rather than requiring existing buildings to meet and exceed the requirements of the energy code for new construction, as is the case currently in 179D, measure improvements in how much energy consumption was reduced compared to where the building started. Link the amount of the incentive to energy savings achieved. Greater energy savings and deeper retrofits warrant larger incentives to reward innovation and to reflect the larger investments and greater environmental benefit. Energy savings in excess of 50% are possible, and will be encouraged by this approach. Tie a portion of the tax incentive to implementation of efficiency measures and a portion to demonstrated energy savings. There are good reasons to reward a building owner for implementing energy savings measures, and even better reasons to reward energy savings actually realized on the energy meter. This proposal uniquely does both and maximizes accountability by allowing the building owner to claim 60 percent of the incentive at the time the energy efficiency measures are put into service, and the remaining 40 percent of the incentive after two years of demonstrating the expected savings have occurred. This last principle would be groundbreaking for energy tax policy. Instead of providing an incentive up front when the measures are installed but not requiring follow up, we are suggesting that 40% of the incentive be held until there is confirmation of success. This unprecedented level of accountability will encourage the proper operations and maintenance in high performance buildings, an Achilles heel of efficient designs that depend on the operators to live up to their full potential. In the end, more than 85 organizations representing real estate owners, builders, contractors, building managers, energy service companies, building efficiency manufacturers and suppliers, energy efficiency financiers, environmental advocates, architects, engineers and other stakeholders supported these principles. Stay tuned for updates on our progress as we work to turn these principles into a bill in Congress and then generate support for its consideration.